Darby's bridge was the first in the world to be made entirely of cast iron. The bridge's arch spans 100 feet and has five arch ribs, each cast in two halves. All the major parts were put together in three months without a single accident or the least obstruction to the boats in the river. When it was finally complete, artists, writers, and engineers came from all over the world to marvel at the unique design. 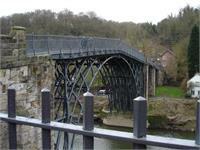 Today, the Iron Bridge is considered a British National Monument. The Iron Bridge Theatre in Tyrone is once again preparing to wow audiences with its upcoming dinner theater production of “Godspell.” The performance of the.